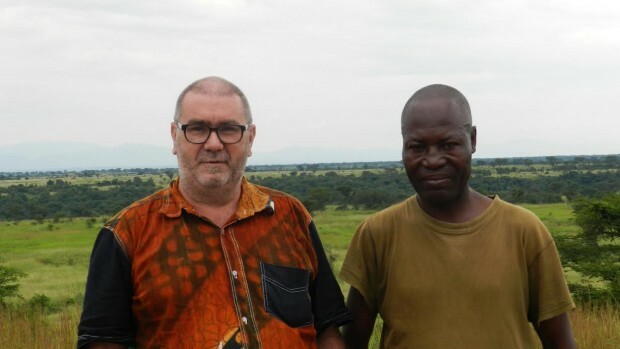 Kris Berwouts with the commander of a small FARDC camp in Virunga National Park overlooking the border with Uganda. In November and December 2013 I traveled overland from Kampala to Bukavu and back again – sharing taxis with the people of Kivu. No convoys and certainly no armed escorts. Only a few weeks before, the war with M23 had ended with a military victory for the FARDC supported by the international UN brigade. Some days before I drove from Butembo to Goma, the army dismantled ten road blocks in the Virunga National Park – a hiding place for many armed groups. I knew that insecurity had decreased in Kivu and I had heard that the relationship between the Congolese and their army had improved, but I wanted to see what difference that made to their daily lives. In an article on African Arguments publish in November 2013 I had concluded that the end of the M23 crisis was an important part of the Framework Agreement as signed in February 2013. A lot would depend on the implementation of the other bits of the Agreement: the Terms of Reference of the new Monusco Force Intervention Brigade stipulated that not only M23 but also the other armed groups would have to be disarmed. Countries in the region should not interfere in each other’s internal affairs and Congo would have to do the rest of its homework. This includes reforming the security sector and government institutions, consolidating state authority in the east and preventing armed groups from destabilizing neighbouring countries, strengthening the agenda of reconciliation, tolerance and democratization, to make progress in the decentralization process. Whilst the end of the tunnel undoubtedly remains far away, at least the armed forces had made progress and had won their first major victory since time immemorial. Perhaps this event carries the seeds of the Congolese state’s full renaissance. However, nothing particularly spectacular took place immediatley after the military victory (unless you consider the end of the Kampala negotiations to be a major event). On December 12th, the Congolese government and M23 concluded their talks with something that was not quite rightly called a “˜peace agreement’. No single document carries both parties’ signature. The GoDRC and M23 each made their own statement which were both covered by an overall declaration signed by President Museveni as Chair of IGLR and President Banda as Chair of SADC. The “˜agreement’ consists thus of three separate documents. When talking to people in the field I did not get the impression that we were close to a military action against the FDLR. This is, among other reasons, because of the high risk of collateral damage in a landscape with many “˜grey zones’ between FDLR fighters, Rwandan Hutu civilians, Congolese Hutu militia men and Congolese Hutu civilians. Preparations for the next military campaign focused on ADF-Nalu, because of the alleged “˜Islamist’ agenda of this militia with Ugandan roots – one of the oldest but least understood armed groups in the Kivus. Around Christmas, ADF-Nalu tried to reinforce its positions around Watalinga, which eventually led to the killing of at least 40 civilians in Kamango, near the Ugandan border. On the morning of December 30th Kinshasa was shaken by three short but violent incidents: lightly armed people entered the buildings of the RTNC (Radio et Television Nationale Congolaise) and similar attacks took place around the military camp Tshatshi and at Ndjili International Airport. Although the confusion of people fleeing and rumours circulating lasted for hours, the police were able to control the situation quite quickly. Later that day there were skirmishes and riots in Lubumbashi, Kindu and Kisangani. On New Year’s Eve, the government declared that more than 100 people had died in the incidents. The attackers were eventually identified as being followers of a religious leader claiming to be the “˜Prophet of the Eternal’, Paul Joseph Mukungubila. This self-declared spiritual leader lives in Lubumbashi and is a former (rather unsuccessful) presidential candidate (59,228 votes in 2006) whose heavenly messages are heavily mixed with anti-Kabila and anti-Tutsi hate speech. At this point it is very difficult to understand exactly what happened and why. The government has done its best to reduce the incident and its relevance to the Prophet’s narrative and present it as an isolated action of religious zealots. But Congo is a country with an outspoken taste for rumour and conspiracy theories. Even before the incident was over, it had been called a coup attempt with much speculation about who exactly within the political or military elite was behind it. The incident happened only two days after the official confirmation of Charles Bisengimana as Chief of the National Police. Bisengimana, a Tutsi who was part of the rebellion of Laurent Kabila in 1996-1997, had been acting Chief since General John Numbi was suspended due to his possible involvement in the assassination of senior human rights activist Floribert Chebeya in June 2010. Whilst an important part of Congolese and international public opinion believes that Numbi was responsible for Chebeya’s death, the Katangan General has never been accused and even less tried. Numbi, until his suspension, was one of the key personalities of the regime and was hoping for official rehabilitation. For many years, tension has been palpable within the Katangan circles that surround President Kabila. The cement holding the group together is fundamentally economic and based on common interests. Katanga is not only the economic heart of Congo – producing the bulk of the central government’s tax revenue – it is also the stronghold of the Kabila regime. The government that Prime Minister Augustin Matata Ponyo (himself from Maniema) has lead since April 2012, consists of 2 deputy prime ministers, 25 ministers and 11 vice-ministers. One deputy prime minister and eight ministers come from Katanga. We should remember that Congo has been waiting for a government reshuffle since the end of the national consultations in September 2013. It is important to see the actions of a Katangan prophet and his followers in the context of a powerful Katanga, worried about losing space and influence in Congo. This is especially the case after the disappearance of its two key leaders: Numbi’s suspension in 2010 was followed by the death in a plane crash by Augustin Katumba Mwanke in February 2012. The prophet’s march was not a coup attempt but rather a sign that the Katangan pillar of power in Congo is not reassured that Kabila is serving their interests well. Three days after the incident with Mukungubila’s followers, on January 2nd Colonel Mamadou Ndala was killed in an ambush near Beni. The colonel was in charge of military operations in eastern Democratic Republic of Congo and had played a crucial role in the military victory against M23. For an important part of the population, the Colonel represented the new found efficiency and discipline which had allowed the Congolese army to defeat M23. The reactions were emotional all over Congo, but in particular in North Kivu. He was in Beni to lead an FARDC operation against ADF-Nalu. The initial hypothesis therefore being that they are responsible for his death. However, many people believe that his death is the result of jealousy and tensions between different parts of the army. Despite recent progress in the FARDC’s performance, the Congolese army remains the product of a disappointing and slow integration process of a heterogeneous, undisciplined, badly trained amalgam of different militias whose leadership sometimes has different political affinities, competing ambitions or conflicting business interests. Colonel Mamadou achieved (in a very short time) a degree of popularity within the community previously unheard of. It can of course not be excluded that his rising star thwarted someone else’s plans and interests.Some have suggested that he was killed by FARDC officers with an ex-CNDP profile whose loyalty has never entirely been with the national army of the DRC. One can of course not exclude a hypothesis of a hit & run action carried out by M23. The rebellion was defeated some months ago, but their leaders didn’t see their defeat as if they lost a war. For them they have simply lost a battle. They have no confidence in the GoDRC’s will and capacity to materialize a real reform programme. Colonel Mamadou as the icon of their defeat would be an obvious target of a low profile military strategy. Some in Goma believe that Colonel Mamadou could have been killed by high-placed politicians who fear that his and the army’s rising popularity could become a threat for them. What will be the consequences of Colonel Mamadou’s death be for the peace momentum created by the military victory? The improvement in the army’s behavior and performance was of course not the work of one man alone. And a Congolese army that can carry out successful operations is an important development, but a successful reform of the security sector is something else entirely. The challenge will be to consolidate it in North Kivu and to extend it to the rest of the country. It was great fun travelling in North Kivu in November and December. Of course I knew how fragile it all was, but you could feel the difference. Change starts in the heads of the people who believe that it is possible. The final phase of the M23 crisis had brought the people and the army closer together. And Colonel Mamadou Ndala represented that. I am not sure what Mamadou’s death will mean for the relationship between community and army. It is qute likely that it will increase the distrust and hostility between different sections of the army. Congo’s ability to implement an efficient DDR programme and thus dismantle the remaining armed groups will decrease if the army loses its newly found efficiency and relative transparency. The war was won because people were paid and the connection between logistics and military remained tight. Uniforms, arms and ammunition were available where and when they were needed. Personally I believe that the GoDRC is still in the driving seat of its own itinerary. I don’t think the window of opportunity has been lost. But much will depend on Congo’s efforts to make genuine efforts to reform the security sector, democratize its institutions and to establish an efficient and transparent administration. The international community will have to be very vigilant to make sure that neighbouring countries also respect and apply their own bits of the Framework Agreement. Kris Berwouts has, over the last 25 years, worked for a number of different Belgian and international NGOs focused on building peace, reconciliation, security and democratic processes. Until 2012, he was the Director of EurAc, the network of European NGOs working for advocacy on Central Africa. He now works as an independent expert on Central Africa. Kris’ current field research is made possible by a working grant of the Pascal Decroos Fund for Investigative Journalism.